Grasslands, also known as prairies, support a diversity of plants and animals adapted to prairie soil, water and temperature conditions. Six major North American grassland regions include tallgrass prairie, mixed-grass prairie, shortgrass prairie, Palouse prairie, California valley grassland and semidesert grassland. Snakes, toads, salamanders, hawks, larks, pipers, antelope, hares and owls are just some of the animals that live in grasslands amid a huge variety of grasses, herbs, shrubs, flowers and prickly plants. Prairies support a large variety of plants and shrubs. 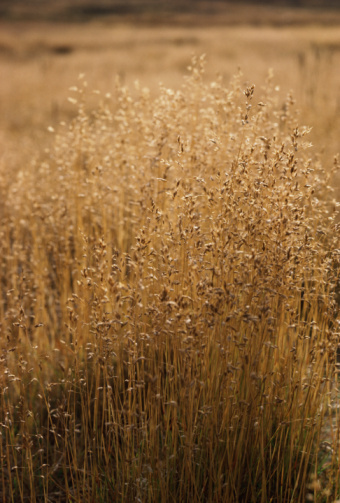 Bluestem grass includes small and large varieties of long-lived perennial, seed-producing blue-green grasses. The plants range in height from 1 to 3 feet tall growing from a central crown in an upright fashion. It grows well in prairie soils ranging from sandy loam to poor topsoil, tolerating sporadic rainfall and heat. Yucca is a perennial shrub related to agave. It has stiff, spear-shaped, dark-green leaves and produces tall white flowerheads. The flowers of the yucca plant are New Mexico's state flower. They are pollinated by yucca moths that also lay eggs in the flowers. Yucca plants are very hardy under a variety of hot and cold conditions and are drought tolerant. Common sunflower is a sturdy annual flowering plant related to Asters. It grows to 6 feet with multiple flower heads branching off a central stalk. The flowers follow the sun in the sky. The large, yellow flowers bloom all summer long and end the autumn filled with fat seeds cased in black or black and white striped husks. Big sagebrush is a large, perennial herbaceous shrub. It grows in poor soil in dry-to-moderate climates. It is a profuse seeder, producing as many as a million tiny seeds per plant that easily and readily sprout and grow into huge tracts of sagebrush shrubbery. As an evergreen shrub, it is important to domestic range animals and wildlife as winter food, especially deer, livestock, wild fowl and small mammals such as rabbits, mice and squirrels. It is Nevada's state plant. That state's nickname is the "Sagebrush State." Prickly poppy is also called thistle poppy and the cowboy's fried egg plant. It's a large, herbaceous evergreen flowering plant with large white petals and a bright yellow middle resembling a fried egg. The plant grows up to 4 feet tall and has large, spiny leaves growing on tall leggy branches covered with yellow spines. All parts of the plant are poisonous.